Winter is over and the warmth of sunshine and clear skies is drawing people outdoors once again. As you turn your face to the sun, take a minute to consider that each day the sun delivers enough power to provide for the energy needs of the entire Earth – for a whole year. Yet, much of that power goes unharnessed and wasted; while people, instead, pay hundreds each month for energy from their local utility company. What is the answer to this waste? Do you own your home? In order to experience savings from solar power, you really need to stay in your home for at least ten years. It generally takes this long for you to recoup your investment. At this point, you’ll see savings in your monthly bills, possibly earn credits for energy you don’t use, and see an increase in your home’s resale value. Where is your home located? Your final choice of panels will be influenced by the amount of sunshine, or solar radiation, and the temperatures in your area. Other factors to watch out for include free shading, the angle and condition of your roof, and the permits that your municipality may require. In some areas, the utility company is willing to buy back excess power, but in others the utility company will assess a special monthly charge because you have panels. How much energy do you use? If you are already conserving energy and your monthly energy bill is low, then you may not see enough savings to make the investment cost efficient. However, most people will find that the installation of a solar power system results in substantial savings. Can you finance a solar panel system? The cost of an entire system can be quite an investment – into the tens of thousands. Some homeowners have turned to a solar lease, if their credit is good. There are also some rebates available to help you with the initial costs of the system. These include both Federal and State incentives. The rebates vary from state to state, so check into this before proceeding. With the help of rebates, you may be able to reduce your costs by 30%+. How prevalent are power outages? You may believe that solar panels will keep your appliances running during a power outage. However, in order to achieve this benefit, your system needs to include a battery backup system; this is very expensive. Most solar power systems are still connected to the municipal power grid and will turn off during a power outage. This is a safety feature. Maybe one of the biggest obstacles standing in the way of widespread solar energy use is the initial cost of the panels. The chance to lease panels can provide a solution to this dilemma. Many solar power installers have a program available that allows homeowners to rent the money-saving panels. The combined amount of the lease payment and the electrical bill should still be less than the amount that you are currently paying for power. The leases typically last between ten and twenty years, with monthly payments ranging from $30 to $300 a month. As part of the terms of the lease, you can often get the solar panels at no cost and a locked in low price, even when other utility rates increase. Some leases qualify for tax depreciation benefits. When the lease ends, you’ll have the option of extending it, upgrading to newer panels, or removing the panels. Bank Loans for Solar Panels: Banks and other financial institutions realize today that solar panels are more popular. The lenders are now willing to offer low interest rates for loans on solar power systems. Partnerships Between Solar Services and Local Companies: Some solar power providers collaborate with local companies to provide the financing that many homeowners need in order to pay for the installation of their panels. This is called a “Solar Power Purchase Agreement” or solar PPA. You pay a fixed rate for the electricity produced by the solar panels. The rate is normally set for about 20 years. With these financial options, you may find that it isn’t too hard to obtain the solar power system that you’ve been wanting. If you have determined to take advantage of the benefits of solar power, the effort to obtain financing shouldn’t be too prohibitive. These two types of panels operate in the same way. The difference between the two lies in how the seed crystal was used to create the panels. 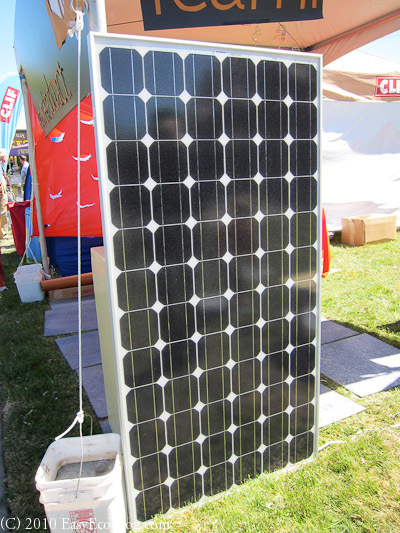 The crystal panel represents the classic version of solar panels. It delivers about 12-13% power conversion with just over 19% efficiency. They have a long lifespan, sometimes reaching over 30 years. 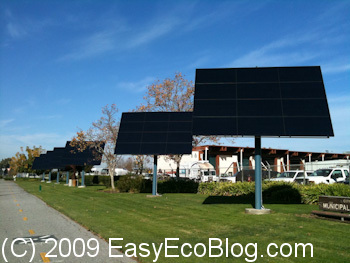 These panels are very susceptible to shading and homeowners will notice up to 50% less power if just one cell is shaded. They will also work less efficiently when temperatures reach more than 75 degrees Fahrenheit. These panels tend to be less efficient than crystal panels, reaching only about 10-12% efficiency. However, they might outperform crystal panels in areas where shading and higher temperatures are a factor. The lifespan of these panels is about ten years, but they are generally less expensive initially. Unfortunately, these panels also require a great deal of room in order to achieve the desired output. As the technology improves, these panels should see better levels of efficiency. These panels are made up of single crystalline silicon and ultra-thin amorphous silicon layers. The hybrid option delivers more electricity than the classic crystal panels. They offer about 16% efficiency. Discuss the pros and cons of each type with your solar panel installer to decide which of these options will be most appropriate for your situation. These units convert DC power to AC power. Each unit can only handle so many solar panels. Newer models have better efficiency at converting power. How many inverters do you need? Where will they be positioned? Do you leave room for future solar panel additions? Some communities require inveters to be in the shade and away from fire hazards. 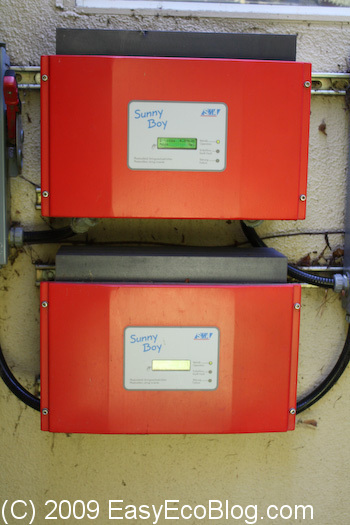 We recommend sticking to popular name brands like the Sunny boy. Micro power inverters are small inverters that are usually connected to the bottom of each solar panel. Instead of having a large inverter wired to all the panels, the micro inverters convert DC power to AC power right at the solar panel. This is relatively new technology, so you need to proceed with caution. Ask how do these inverters stand up to weather and sun exposure? How long has the installer been in business? How many installations have they completed? Which solar manufacturer do they work with? Who makes the panels, the power inverter, the solar panel mounting racks, etc? Are they commercial grade and are they covered by a factory warranty? How efficient are the solar panels? What is the PVUSA Test Conditions (PTC) per watt rating? What is the guaranteed minimum power rating? What financing options does the installer provide? Ask for two Solar System quotes: one to zero out your bill and another for a smaller system that will substantially reduce your utility bill. The installer should take time to visit your home. They should inspect your roof and the orientation of your property, take a look at your utility bills, and discuss your goals with you. After this inspection, the installer should provide you with a solar system design for your home, a financial analysis, and the financing options that fit your needs. If you already have one type of solar panel or system in mind, your installer should be able to list the advantages and disadvantages of that particular panel. If you don’t have a preference, the installer may share some advice and make a recommendation for you, based on your budget and home. Once you get your solar panels installed, you will find them maintenance free. Most are rated for a very long 30 year lifetime. As you can see from the above picture, solar panels can and do get dirty. 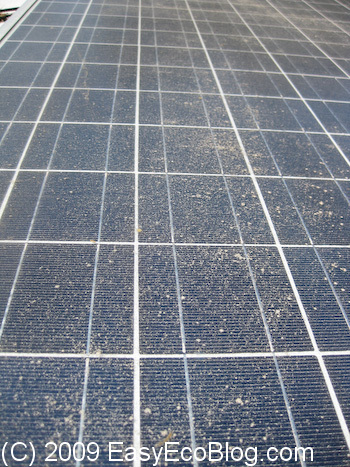 Pollen, bird droppings, dirt, and dust can build up on solar panels. We try to clean solar panels at least twice a year. March/April when the rainy season has passed, and August/September, towards the end of summer. Pollen from our nearby evergreens really sticks to the panels. Try to clean pollen off before it bonds, otherwise a cleaning solution may be needed. Use a soft brush and some water that your solar company recommends. Before you turn your face away from the sun, reflect on how rejuvenated you feel after some time in the sun. This same source of energy can be used to power your home and reduce your reliance on other energy sources. Doesn’t that feel good? Your home's value will increase after you install solar panels!